For fiber clearing both special solvent and simple spirit may be used. Storage tank’s volume is 45 ml, which is enough for 120 cleaning operations. Cleaver is equipped with oil damping system, which significantly improves quality of cleavage surface (see image to the left), and container for gathering of fiber cleavages. Cleaver’s blade (to the left) and images of performed cleavages by Normal cleaver (in the center) and with applying of oil damping system (to the right). 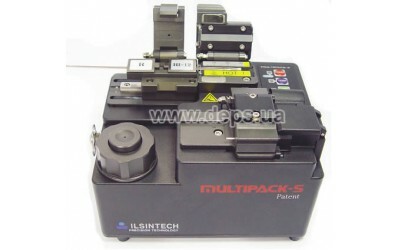 МULTIPACK-S – portable installation system – three in one – for preparing of fiber for splicing. 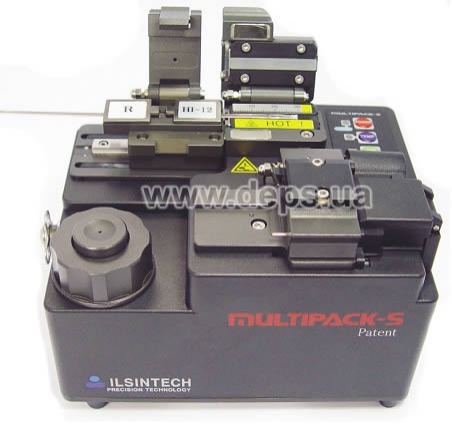 It is composed from automatic thermal-stripper, fiber cleaner, and cleaver with oil damping system. 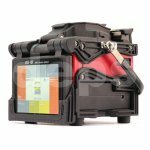 System is designed for both inside and outside operations, with that qualified worker will need no more than 15 seconds for preparing of fiber for splicing. Automatic thermal-strippet is equipped with precise electrodrive and special knife, its operation is automatic due to built-in sensors controlling the preset heating temperature.